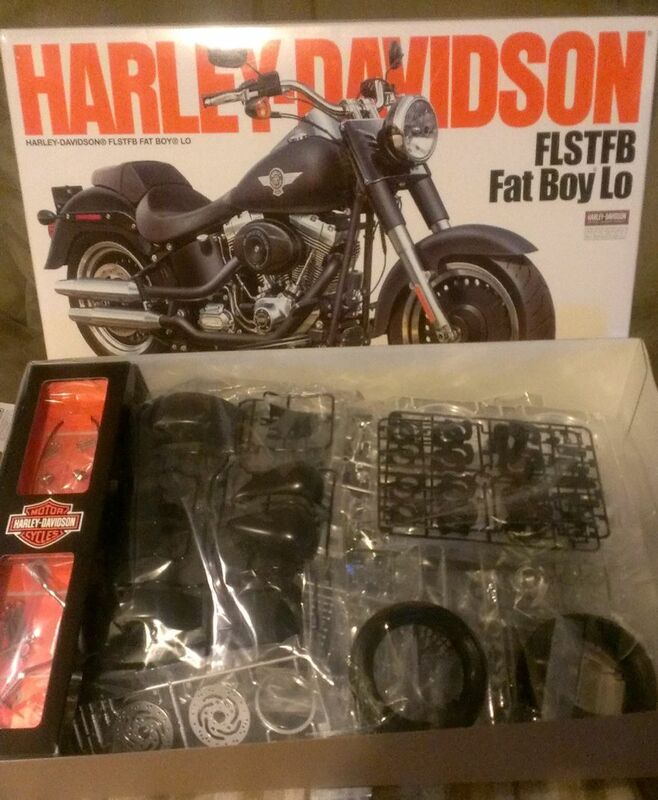 HARLEY-DAVIDSON FLSTFB Fat Boy Lo | The M.o.B. 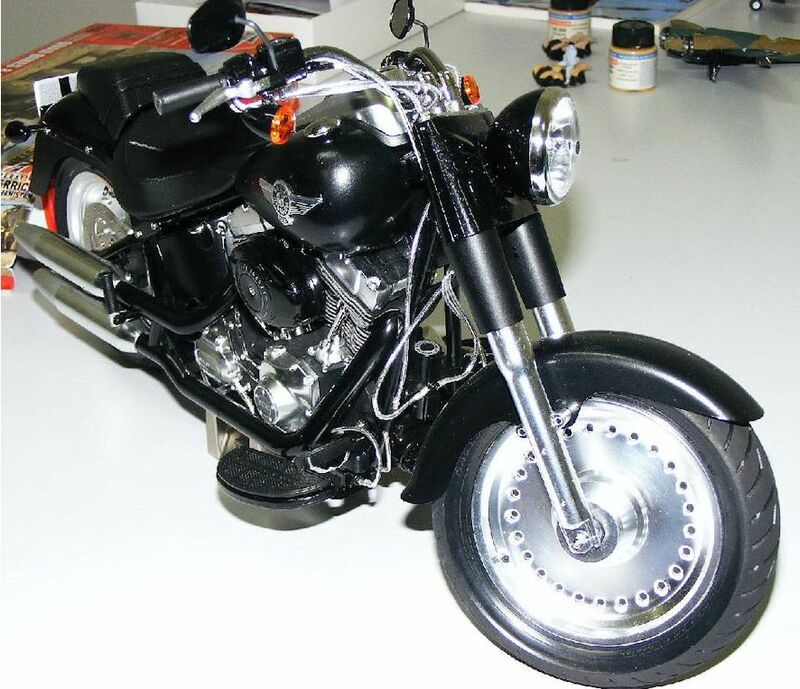 Wow a new 1:6 scale Harley Davidson motor bike from Tamiya, so excited as I have built all the others models years ago. Thump to the ground. After picking myself up crying at the price of it…..I thought maybe I could get it on the annual mob bus trip to the big smoke, so time to start saving and of course I had to have the detail-up parts kit also, bringing the purchase up to almost $400, but like any other mobster would say, IT WILL BE BEAUTIFUL……. Opening the box to find, twenty sprue’s moulded in five different colours, various metal parts which consisted of five bags of screws, nuts, bolts and springs. Two rubber tyres. A decal sheet. A set of tools and a instruction book. Not including the metal brake disc’s and exhausts and a number of other metal parts in the extra detail set. After reading the instruction’s many times, it was time to bite the bullet and start it. I didn’t like the idea of all the leads on the bike being just the black vinyl tube that was included in the kit, so it was of to Spotlight to see what I could find, its more than a shop for wool and material, so after walking up and down the isles I found some braided chrome line and chrome ends to be used as joiners for all the lines on the Harley Davidson. Having the colour scheme worked out, was simple, black, and all shades of it too, gloss black, semi gloss black and flat black. Just lots of it. As I don’t follow instructions by the numbers I started by joining the tank, preparing the front and rear guards ready to paint, which involved spraying two coats of flat black(XF-1) as undercoat, four coats of semi gloss black(X-18) then finally four coats of semi gloss clear(X-35), with a light sanding in between coats, now I was happy with the outcome I placed them aside till I was ready for them later on in the build, as I will end up with many sub assembly’s ready to use when needed. Then the story of the kit came out in issue 227 of Tamiya Model Magazine International, I agreed with the problem of trying to mask up the wheels to paint black, not that I needed to worry about that as I didn’t want to paint them anyhow, but it was very handy to use this as great reference material. Then onto the wheels, they look great but lacked one thing, tyre valves, as they are so big it stood out by not having any. So off to the spare parts box to make some. I ended up using a paper clip and vinyl tube, I think they look ok. 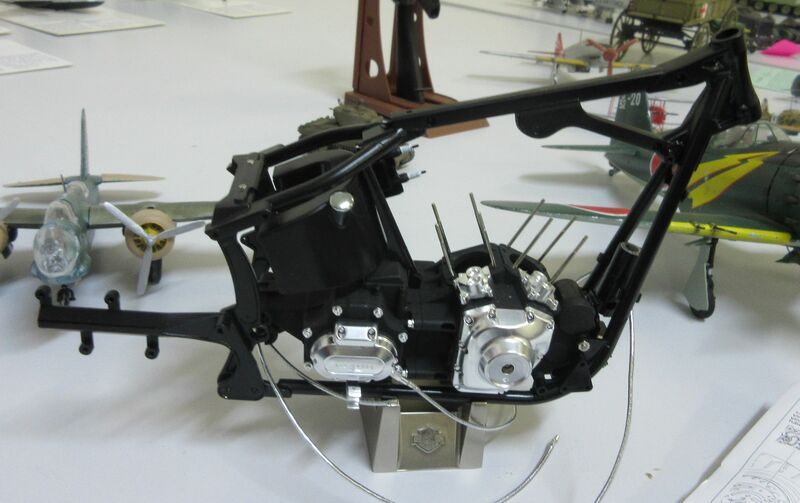 The engine block was the next thing that I put together, more black paint (XF-1). Then the frame was joined, prepared and painted, yes black again. Mounting the engine block into the frame with screws, as was the rear swing arm and rear wheel, attaching the drive belt, rear shocks and large rear wheel more screws and bolts, great for strength as it starting to grow in size. At this point of the build I added three sinkers to the engine block to give it a bit of weight and to sit with a bit of attitude. Then the cylinder heads, which are all separate parts (21 each cylinder) and that took two days to prepare ready to paint, yes more black paint, with silver edges on the fins wow a different colour. The battery was added and wired, don’t know why I did this as you don’t see it under the seat, but I know it’s done. Exhaust pipes added and the black cover attached using the double sided tape in the kit, left and right foot plates added and both back brake and gear levers move, the front head light added and the front forks, were next, no need to get the glue out for this stage as it all just bolts together, leaving you with a fantastic set of fully working front forks, joined to the frame, then adding the front guard and wheel, its getting to be a huge model. Then time to add the tank and gauges, the badges on the side of the tank were painted using Tamiya black panel line accent colour paint, by painting it and removing it, repeating the process till completely covered, as I didn’t think the decal would have conformed to the raised edges of the badge. The rear guard was added with the help of some nice hex bolts and the rear light assembly that also screws together. 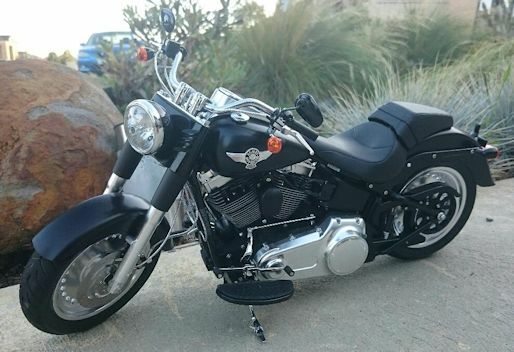 It is really looking like a Harley Davidson now and is getting harder to work on as the size and weight are starting to tell. The indicator’s were moulded so they just push together. 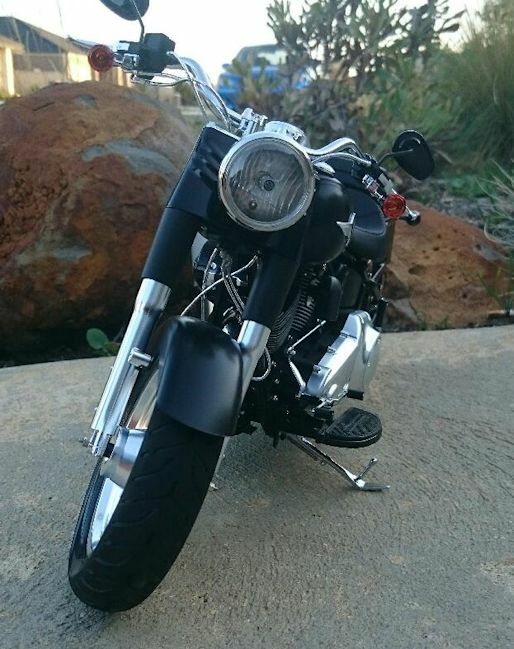 The only leads on the bike that aren’t braided lines are the spark plug leads, which are made out of the tubing from the kit with wire pushed inside of them so they curve just right. 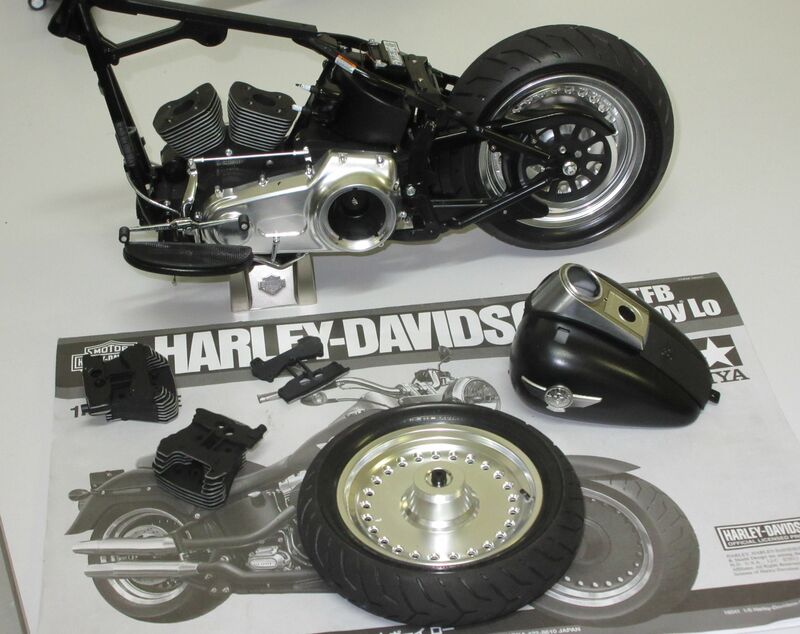 Seat assembly was next, wow they look really good without painting them, and are mounted to the bike with chrome hex bolts. 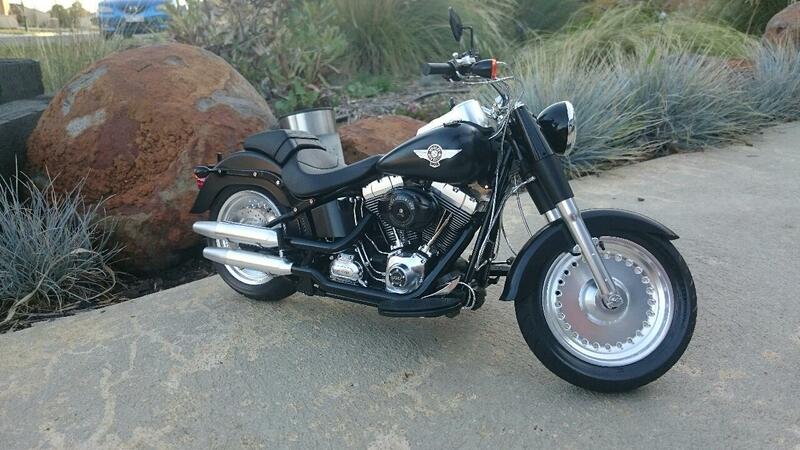 The metal handle bars and levers were next. This is were I found a mistake in the instructions, as the said screws to use to mount them to the forks of the bike, I only had three of and I needed four. Time to panic…. breathe Sean and have another look through what screws that were left with, I found four screws the same size in a different bag labelled differently, I can stop having a heart attack now. time for a rearrangement of the cabinet. 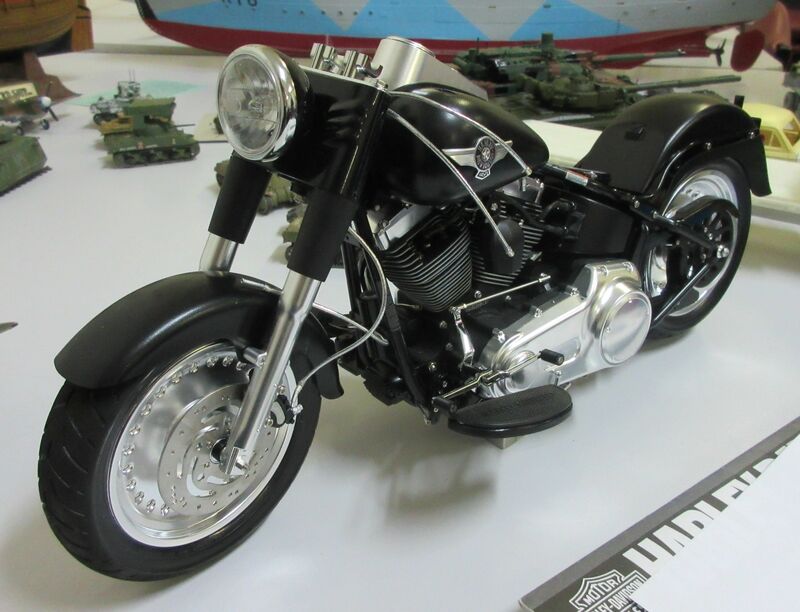 To finish off with, it was a great kit to build, one with a very little glue needed, nothing like the older Harley kits from Tamiya, a complete new model. How did you paint the engine?